Does Cutting the Payroll Tax Endanger Social Security? Does the recently extended payroll tax cut harm the solvency of the Social Security trust fund? Answer: no it doesn’t. The shortfall is made up with payments from the general fund, so the trust fund suffers no loss of income at all. Democrats have undermined their own arguments about the true nature of the Social Security program (turns out it really is a tax-based welfare program, not a dedicated, contribution-based retirement program), and  Republicans either ought to take them up on it, or flip the thing one more time and pose as the principled champions of Keeping Social Security Solvent. Walsh’s objection is one that several liberals have also made about the payroll tax holiday. Echoing FDR, they say that if Social Security is funded out of ordinary tax revenues, then the historical “legal, moral, and political right” to Social Security benefits is broken. Social Security is just another social welfare program. I don’t buy this for two reasons. First, I just don’t believe that a small, temporary cut in the payroll tax has any effect on how people view Social Security. But second, I doubt that even a permanent switch to general fund support would have any serious effect on the program. 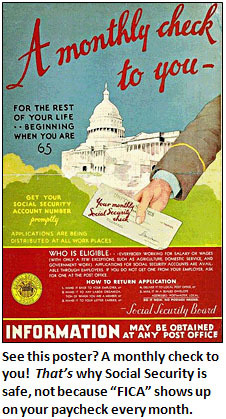 In 1935, when Social Security was brand new, FDR might have had a point. But today? With Social Security as firmly a part of the American political system as anything this side of the Army or the Treasury? I don’t think so. I just don’t believe that the funding source matters any longer. Social Security is safe because millions of the elderly count on it and more millions of the non-elderly expect it to be there when they retire. It’s safe because it’s an enormously popular program, not because payroll taxes mean that you “deserve” your benefits when you retire. It’s safe because any politician who tries to cut it finds himself very quickly on the business end of a million postcards from AARP members. So the payroll tax holiday doesn’t bother me. Anyone who’s “paid taxes all my life” is going to feel that they deserve their Social Security, and it won’t matter a bit what taxes they’ve paid all their life. Hell, most people don’t even know what taxes they pay, and “FICA” might as well refer to a newly found gene for why men won’t ask for directions as it does to a funding stream for Social Security. So cutting the payroll tax is fine. Technically it doesn’t make any difference, and morally I very much doubt that it changes anyone’s view of what they deserve when they turn 65. This is just not something to worry about.